Just a quick post – sharing a podcast that I did with Thomas Jones, I’ll be attending Interop in NYC this week and I’ll be presenting as part of a virtual seminar on October 27th. I had the pleasure of recording a podcast with Thomas Jones (who I met in person at EMC World this year) – it’s a nice relaxed conversation with the two of us talking about technology (VMware, stacks, network convergence and mobile) and social (blogging). You can listen to the 30 minute podcast here or on iTunes. Be sure to check out Thomas’ other segments with some of my favorite people including Mark Twomey, Louis Gray and Jamie Pappas. I’ll be attending the Interop conference in New York City (Javits Center) on Wednesday and Thursday. I’ll be talking to a number of networking and cloud vendors. It’s been many years since I’ve been to this conference (it was Networld+Interop the last time I went), I’m curious to see how this independent show compares to the “World” vendor shows (EMC, VMware, Oracle, etc). Anyone who is attending that would like to chat, drop a comment on the site or ping me on Twitter. The hashtag for the conference is #interop. On October 27th, SearchNetworking.com (TechTarget’s networking group) will be holding a free virtual seminar called Network Evolution: Adapting to New Architectures. There will be a cloud presentation by John Burke, a virtualization presentation by Eric Siebert and I will be presenting a converged network presentation. My session will cover the latest in FC, Ethernet (FCoE, iSCSI, 40/100GbE) and InfiniBand. The session is an hour long, about half of which is Q&A from the audience, so please come and bring your questions – register here. Hope to see you at one of the events online or in person. Next month I have the pleasure of attending VMware’s VMworld conference in San Francisco. Not only is it an important conference for virtualization, but the storage, networking and compute ecosystems are all strongly represented. I expect to be pulled in many directions between sessions, analyst meetings, and video (it looks like “The Cube” will be coming to VMworld). Most of my content from the conference will go on the Wikibon site (where you can find all of my “day job” blogs and research). The theme of the conference is “Virtual Roads. Actual Clouds.” and just as the conference message is about converting messaging to reality, I look forward to taking many of my online interactions to real life discussions. John Troyer of VMware created a wiki document of Social Media contributors for the conference. If you are attending, make sure to put in your Twitter and blog information. I took the people that have signed up and created a TweepML list (and I will update this list as people update the wiki). If you’re not familiar with the tool, it allows Twitter users to follow everyone on the list with a single click (it will authenticate your account). I’ve seen some really good TweepML lists for virtualization and cloud, and thought that one for VMworld could be useful. The easy subscription seems more useful than Twitter Lists or Listorious, what do you think? If you will be at the conference, I hope to meet you there – send me a note on Twitter (I’m @stu). If you won’t be able to attend in person, check out this TweepML list, check out the Wikibon site and blog for content and feel free to contact me if there are any questions that you would like me to raise at the event. I’m really more of a Star Wars fanboy, but while the official theme is “Journey to the Private Cloud”, I’ve seen a couple of Star Trek references: Federation (not the guys in the red shirts, but Storage Federation) has been a buzzword around the industry. This year, if you’re not attending, you have a chance to get a taste of the content and excitement of the event. 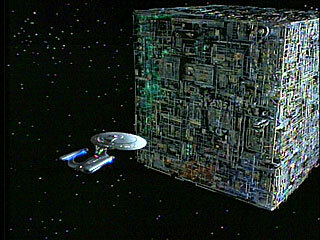 EMC is working with SiliconANGLE who will be bringing “The Cube” (photo above is the Federation Star Ship Enterprise meeting the Borg Cube) to EMC World – see their post, Cloud & Storage Blowout – Chowda, SiliconANGLE, The Cube, and EMC World – Shipping Up To Boston (note that due to BCEC regulations, we’ll be serving “virtual chowder” – gift cards – instead of the real thing). As Stu Miniman says, EMC World is the Superbowl of Storage. It’s the main industry event where the action is not just the show but the partying and side events of which we’ll be covering like a blanket. What content are you getting? THREE keynote speakers (2 of which will be coming directly from the stage straight to the live video), top industry bloggers & analysts, partners (VMware, Cisco, Brocade and others) and more special guests to be announced later. Topics will span everything from Federation, Cloud and Virtualization to Social Media, Security and Sustainability. The broadcast will be LIVE from 2:30pm-5:30pm Eastern time on Monday, Tuesday and Wednesday (May 10-12) and can be seen on http://siliconANGLE.com/emcworld2010. Here is a sneak peek at the schedule (click on the graphic below to enlarge). Note that all items subject to change, but the people named are currently scheduled. Last Update 5/6/10, 4pm. I’ll be participating in the Networking discussion on Wednesday. In a recent Seth Godin webinar that I attended, Seth stated that there is something about live video that excites the caveman in people’s brains. Giving away some free content from a show can pull people into the event, increase buzz and get people more interested in attending live the next time (see my blog post from last year discussing this). If you won’t be at EMC World in person, I hope you’ll tune in and let us know what you think. If you’re new to this site, please consider subscribing to this blog for my ongoing mission to cover EMC World and beyond. What pulls people into conferences? Big name speakers, a nice location, and all of the trinkets that you can fit while not going over your luggage weight limit (or in yet another conference bag)? Of course not, it is the information that is important. 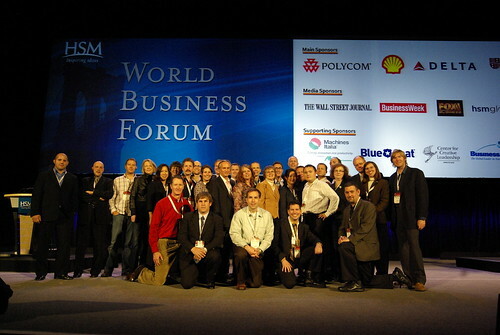 At the World Business Forum this week, it was the connections to ideas and people that made the event worth attending. While I have never presented at such a prestigious venue as Radio City Music Hall or in front of thousands of executives, the basic requirement of a speaker is to understand his/her audience and craft the message accordingly. Many of the speakers did a great job at connecting with the audience and hitting the critical issues in the world today. I plan on writing a number of posts on the speakers that connected strongly with me. I have added to my reading list – Bill George‘s book was given to all participants, I plan on picking up Pat Lencioni‘s soon and I’ve subscribed to Gary Hamel’s blog. The reading will help to reinforce the ideas that I connected with so that they don’t fade away 72 hours after the conference. As for the people that I connected with, I don’t expect to be hanging out with George Lucas in the future, but I do expect that I will keep in contact with many of the bloggers that I met. In addition to the bloggers that I knew from the World Innovation Forum, I communicated with some of the bloggers prior to the conference on LinkedIn as we prepared for the event. Two days of blogging, Tweeting and a couple of meals together starts a nice connection. Through social media, those of us that share common interests can stay connected easily. Below is the group photo of the bloggers on stage – if you click on the photo, it will take you to Flickr where I have tagged people. I have also created a Blogger’s Photo Wall (see the “page” or “tab” at the top of this page). To continue the discussion and follow my posts, please consider subscribing to this blog. In the current economic situation, a marketing idea that has gotten a lot of discussion is how business can use FREE to engage with customers. Not that everything should be free, but that the idea can be used to give people a good understanding of a product or service before having to commit money. Conferences and events have been under intense pressure with the economic conditions, especially those that require travel — which is one of the tightest controlled budget lines. I have attended a few conferences this year and most of them have been embracing social media to enhance the experience. In order to reach larger audiences, companies have been providing remote participation options. Cisco’s Cisco Live and VMware’s VMworld both have very robust remote experiences (I attended Cisco’s in person and VMware’s remotely). You can watch webcasts of the keynotes for free; Cisco also offers the technical content online for a lower fee than attending. The one piece of the conference experience that is toughest to replace is the one-on-one interaction. This is where I see social media playing the biggest part; not that blogs and Twitter replace this experience, but they give a flavor of the energy and engagement of the event. People can remotely be pulled into the discussions remotely and will be more likely to want to attend in-person the next time. Social media tools also provide an opportunity to get people engaged ahead of time. The World Business Forum, at which I will be blogging in October, has been doing a nice job of this. They have posted videos, webinars and blogs of the speakers available. Not only does this promote attendance and build buzz, but it should also improves the quality of the attendees and their experience, since they will be more familiar with the topics and will, therefore, have better questions. As a little help for the upcoming conference, I created a FriendFeed room which aggregates some of the related blogs and any Twitter posts tagged #WBF09. For recurring events, there is the further opportunity to build a year round community. I recently got to learn more about the RSA Conference community (RSA is an EMC company). The event is vendor independent, which allows the community to cover the entire security industry. While traffic tends to be highest around the conferences, people share information and connect through the site year-round. The community site has become a valuable resource to the industry, but it has also created connections between people that make the conference a “must attend” event where collaborators can meet face to face. If you have an exciting and engaging conference, don’t kill it or go all virtual. Consider how you can engage the community before and during the conference so that the free experience that they get outside will pull them in. Comments are questions are always welcome and please consider subscribing to this blog. If you will be at the World Business Forum, I’m always interested in discussing innovation and social media.